Following our busiest summer EVER (what with the book tour to Paris and all- more about that later), FA&S is pleased to announce that we’re BACK! With even more of the sarcasm you’ve come to expect (and love). Mostly love. Here’s a quick run-down of what to look forward to this fall. (Note: due to time constraints such as feeding The Boy, conversing with Spouse, disagreeing with Spouse and ultimately no longer talking to Spouse, FA&S is simply TOO BUSY FOR FULL WORDS AND SENTENCES just now.) And yet, somehow, we have plenty of time to type in ALL CAPS. Go figure. Until then…F.U. UTI– best place to get a UTI? Paris, France. 30 minutes and $3 later, antibiotic drugs delivered to my apartment; I felt like Jim Morrison without the bloat. Ego, yes. Bloat? Non. NPR and, of course, the sounds of The Boy whining and Spouse yelling while stepping on an imaginary brake pedal that doesn’t exist. Why anyone would need to brake while driving on a highway is beyond me. With so many lanes to choose from, just glide over to one that you like better. KGB– killer ground bees. I didn’t die but my arm swelled up like Kathleen Turner’s head on steroids. Not a good look for her, a horrible feeling for ME. M.E.– because that’s who was attacked by the bees and that’s who is entitled to high drama (and eggplant parm) until the swelling goes down. Oh, and about that book tour of Paris. Well, in June, I did visit the City of Lights where I was, again, treated to the sounds of The Boy whining and Spouse yelling (plus bread, wine and cheese. And wine.) Also, I read a book on the flight over. Hence the book/tour. 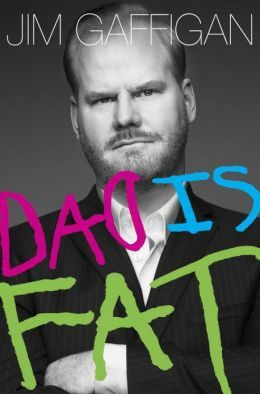 The book was Jim Gaffigan’s “Dad is Fat” but I think it still counts. Also, I figure that the only way I will ever have a book/tour of my own is by linking words like “book” and “tour” and “me” into sentences and then releasing that energy into the universe. And I’m pretty sure that I have the “ME” part down. Plus, I’m certain that Mr. Gaffigan appreciates the plug.